The Team won six matches and drew one while second placed Western Province A won five matches, drew one match but lost one match. To underline Tshwane’s strength and dominance in the Inter-Region Chess Championship, Tshwane B and Tshwane White Team were third and forth respectively. Going into this competition Tshwane were the defending champions and pulled off a very difficult feat, retaining their title in a competition featuring many strong players, a good number of titled players, International Masters (IMs) and FIDE Masters (FMs) and Candidate Masters (CMs). 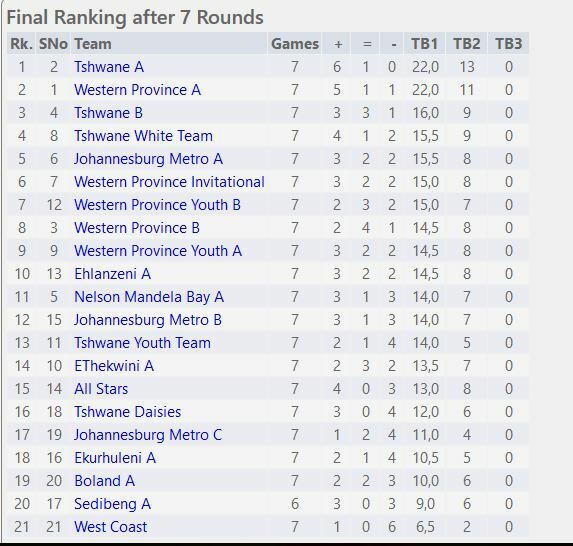 Western Province was dominant in the junior tournament winning most of the prizes but when it comes to team competitions at senior level it seems Tshwane is the province. In Round 1 Tshwane A demolished Ehlanzeni A 4 -0. This was followed up by a 2,5 – 1,5 victory over Nelson Mandela Bay A. In Round 3 Tshwane A trounced Western Province Invitational 4-0. Round 4 saw Tshwane get the better of Western Province A by a score of 2,5 to 1,5. In Round 5 Western Province B did what other teams had failed to do against Tshwane A by holding them to a draw of 2-2. In the penultimate round Tshwane A showed their own youth team, Tshwane Youth Team that there is still a great deal to learn in the game, beating them 3,5 – 1,5. Tshwane then finished off the tournament in style beating the curiously named Tshwane White Team 3,5 to 0,5. Here is the final ranking of the teams. Please note that the games are Zipped!